A Combination of Rustic black alder wood, and 3/8" acrylic front piece create a truly magnificent award in this artisan series. Laser engraved to a frost white color. Presentation Gift box included with this acrylic award. Full color imprinting available as an optional imprinting method for this acrylic award. An award to be cherished for years to come. Rich woods are sculpted into exciting shapes. A piano grade finish to artistically aged patina with a 3/8" thick acrylic front laser engraved to a frost white text. Wood is made of solid walnut and includes black accent acrylic and aluminum accent piece. This acrylic award comes with a presentation gift box. 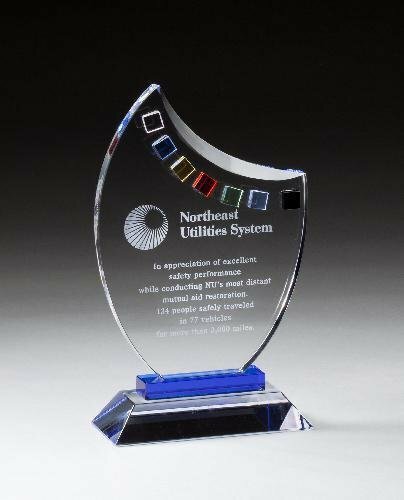 Full color imprinting on the clear acrylic portion available as an optional imprinting method for this acrylic award. Black acrylic engraving is lasered to a frosted white/light gray.